China Bans Foreign Investment In Lucrative Online Gaming Market? Not Quite. Earlier this week, there was a bit of a ruckus over a mandate that was released over the weekend by the Chinese General Administration of Press and Publication and the National Copyright Administration, which suggested that foreign investors would be barred from taking stakes in China’s online game market players in virtually any form. The circular, jointly released by the GAPP and the copyrights association said overseas bodies would be banned from investment in China’s online game operations through setting up wholly owned enterprises, joint ventures and cooperatives. Heck, it even said foreign businesses would be prohibited from joining and controlling Chinese enterprises’ online game operations by indirect means like contracting relevant agreements or offering technological support. The new restrictions would be pure protectionism, as it would require governmental approval for all new games launched within China. Turns out that there’s more to this story though. Inside Social Games, which also reported on the supposed ban, updated its story shortly after publication based on a statement from a source in Beijing. Their source basically informed them that this wasn’t a new policy at all, and that the public feud was apparently part of a major bureaucratic battle between GAPP and the Chinese Ministry of Culture. “It is total BS”, he or she concluded. Indeed, contradictory words are coming from said Ministry of Culture (MOC), from the mouth of Mr. Tuo Zuhai, the deputy director of the Department of Cultural Market who spoke at the Game Developers Conference in Shanghai earlier this week. According to Web2Asia, which exclusively posted a document with the transcribed speech of the government official (also embedded below). To make a long story short, this is a political power struggle, and last weekend’s statement by the GAPP that caused many media outlets to report the ban as fact is simply a small part of that and by no means anything definitive. The second document we embedded hereunder is a translation of a notification from the Chinese Ministry of Culture dated September this year, just before GAPP issued its counter-announcement. 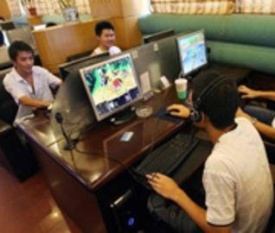 The document clarifies once again that it is the sole administration body for the operation of online games in China. The document also refers to the delays in re-launching World of Warcraft in China, after Blizzard had decided to discontinue working with The9 as their exclusive operator and awarded the contract to its competitor NetEase. All of the large Chinese game companies are listed on international stock exchanges and/or invested in by foreign VCs, as are many promising startups in the field. And we’re talking about a huge, enormously lucrative industry here: China’s online gaming revenues grew 39.5% to $906 million year-on-year in the second quarter of 2009 and is expected to near $1 billion soon, with online operator Tencent Holdings leading the charge ahead of competitors Shanda and World of Warcraft operator NetEase. A recent Reuters report cited data from Analysys International, which said Tencent captured 20 percent of the overall Chinese online gaming market during the quarter. Earlier this year, Pearl Research predicted the Chinese online gaming market would reach a stunning $5.5 billion by 2012, and this seems well within reach. An August report from Niko Partners forecast that there will be 65 million online gamers in China by year-end. It would be a serious measure if the Chinese government were to ban any type of foreign involvement in this business, but fortunately it doesn’t appear that the strict regulations the copyright associations and the GAPP would like to see enforced are not going to become a reality any type soon, if ever.